Coleoftheball: February Posts I loved. Hey guys, so it's that time of the month again where I share with you some of my favourite posts I have loved. I hope you enjoy this and don't forget to check out all the posts I mention as they are all fab! This is a list of handy tips which you can use in order to help growth on Bloglovin', I definitely do find that blog followers are hard to grow in such an over saturated market so I am definitely going to be giving these tips a go! If you've read any of my monthly posts I have loved before you will know I absolutely love photography tip posts and also Lily's blog. This post is just well written, easy to follow and mentions some really fab tips which I am definitely going to be using to up my photography game. I do try not to mention on of Jasmines post in everyone of these posts but I just love them. Along with my current obsession for liquid lipsticks I simply to mention this post. Not only do I love the photography but I love Jasmine's ability to summarise a full review into only a few short sentences. Again this is another well written lot of tips which are really simple and I thought this would be a fab post for any newbie bloggers as it doesn't involve anything complex they are just simple tips to make pictures better quality and more interesting. So I have a little obsession with finding hidden gems which no one ever talks about and I absolutely love posts like this as a way of finding those products. This post actually inspired me to write my second underrated products post so I definitely had to involve it in this line up. I have never actually done a proper spending ban but I have to say this post left me feeling inspired. I am really intrigued as to how I would go on doing one and am definitely considering starting one at the end of this month. What I loved about this is that it was brutally honest and there was no I knew I was going to sail through this. As mentioned previously I am a huge magpie for liquid lipsticks so this post was right down my alley. Again like in Jasmine's post I liked the fact that the reviews were quick meaning that I was able to get the facts quickly. I also loved the way the review were split up so both the liquid lip and the liner each got their own mini review. 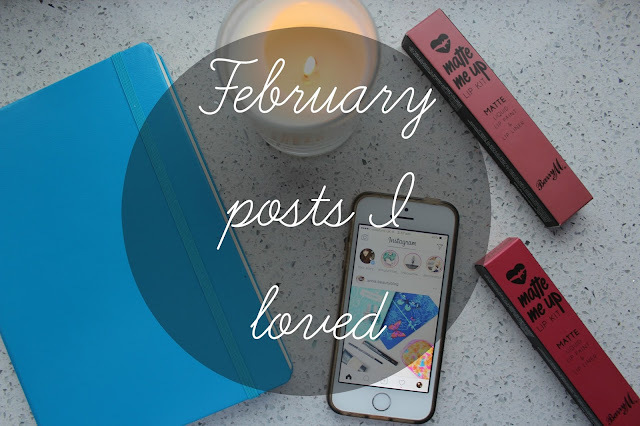 So that's it for today guys, I hope you enjoyed this post and would love for any of you bloggers to leave the links of the post of yours which you were most proud of this month so I can check it out. Lip kits to rival Kylie's?